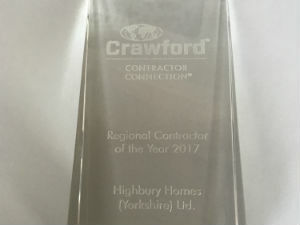 Highbury is pleased to announce that our company has been awarded Regional Contractor of the Year in 2017 by Crawford Connection. The customer-focused philosophy under which we operate here at Highbury means the service we offer is 51% customer-satisfaction based and 49% about building. Crawford Connection has recognised the hard work of our dedicated team and drive to exceeded customers’ expectations. Our attention to client needs and customer care were vital during the surge events of 2015 – 2016, a period in which we experienced an increase in the normal level of work, completing 196 claims, as well as ensuring our business as usual clients were not affected. Many of the claims we completed were outside our usual contracted areas, so our skilled staff welcomed the opportunity to demonstrate our ability as a company to be flexible and go the extra mile for our customers and clients when they needed it the most. During the surge events of 2015-2016, our staff also continued to deliver the same high-quality service to our regular clients based in our contracted areas, despite the increased workload. As the world’s largest publicly listed independent provider of claims management solutions to insurance companies and self-insured entities, Crawford has an impressive global network serving clients in more than 70 countries. In the UK Crawford has 27 offices and operates from these with a focus on outstanding customer service, high performance and transparency. The service the business offers covers a wide spectrum of industries from aviation and media and entertainment to retail and our very own building and construction industry. In need of our residential, commercial, education, social housing or insurance services? Simply contact our friendly team and we would be happy to see how we can help.